The astronomers expect V404 Cyg (plus its unresolved interloper star ~1.4" away) to be around R ~ 16.2, V ~ 18.0 mag. Observers are requested to concentrate on R (or i') photometry, with the hope that "some observers will be willing to observe the source all night at as rapid a cadence as they can get and make a 10 sigma detection for R ~ 16.2, V ~ 18.0 mag. The Chandra and VLA data will likely be binned to 5 minutes, so we want to get better cadence than that. "Observers are also requested please to use an aperture that is about 3 to 4 arcsec radius, if possible. 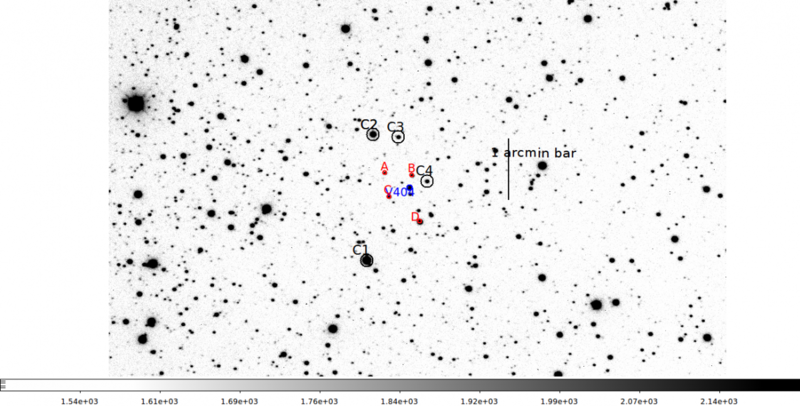 There is another star which is 6 arcsec to the south of V404 Cyg that is about the same magnitude." Two finding charts (links below) have been prepared by the astronomers with stars that should be used for calibration. Please make sure to calibrate using the magnitudes in the list below. 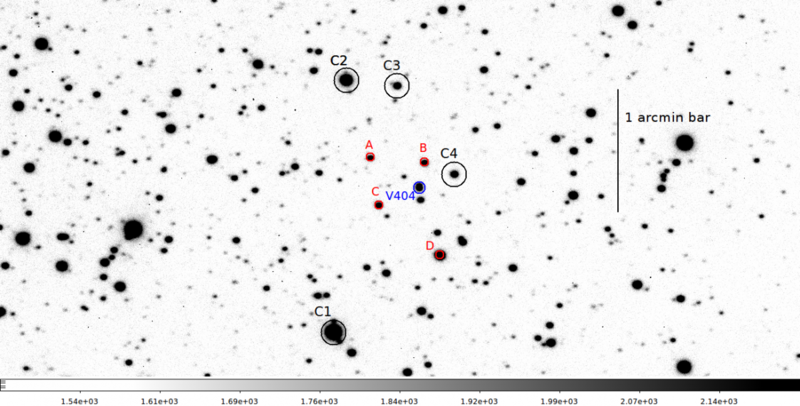 The star labeled C1 is the same as the 128 in the AAVSO sequence for V404 Cyg. Please use the stars in the list below for your observations. Be sure to indicate which comparison stars you used. The above mags are from Udalski & Kaluzny (1991), Casares et al. (1993), Wagner, Shrader & Starrfield (2000), IPHAS DR2 catalogue, APASS DR9, and some derived from the above papers using Faulkes images. Dr. Sivakoff asks observers please to keep their data as he and his colleagues will likely contact observers for followup.